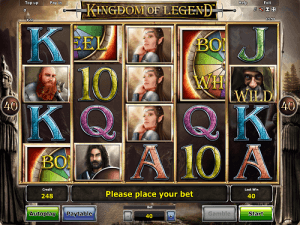 Kingdom of Legend is a slot game, brought to you by NovomaticCasino.co.uk, which is steeped in fantasy and legend. In world where the orcs have taken over, you’ll need to keep an eye on the reels for your fellow warriors, the elven princess and the Wild mage as you embark upon your quest to get a big win. Everything about this game is cool, from the graphics to the epic soundtrack and sound effects. There’s nothing else quite like it! Fans of Faust, Book of Ra and Book of Ra Deluxe are sure to love this awesome slot, as well as fans of Lord of the Rings and The Hobbit, of course! Kingdom of Legend is a great game for more advanced slots players who are looking for something that’s not just a slot but is also a story. With 5 reels and 40 paylines, the astonishing number of ways to win isn’t just a fantasy! Among the lower paying symbols are card values from 10 to Ace, which pay up to x5 your bet. The two bearded warriors pay up to x10 your bet and the elven princess pays out up to x12.5 your bet! The Wild symbol is a mage and he substitutes for all symbols except the ‘Bonus Wheel’. The aim of the game is to spin at least two (for the warriors) or three matching symbols in a winning combination to get a payout. After losing spins, another character might show up: the orc! He might sound and look scary and angry, and shake your screen as he thunders onto your it, however he’s there to give you money! Watch as he smashes the screen with his axe and wait to see how much he’ll give you! Just like with most other NovomaticCasino.co.uk games, you can play for fun until you’re ready to deposit and win real money! Once you’ve got to grips with the game, and you’re happy with your bet, you can put Kingdom of Legend into ‘autoplay’ mode and let the reels spin themselves. On top of that, there is the gamble feature. The gamble feature is a standard 50/50 chance game, where you need to choose correctly the colour of the next card in order to double your win. Keep guessing correctly and you’ll keep on doubling, but guess incorrectly and you’ll lose it all! The Bonus Wheel gives Multipliers and Free Spins! The best thing about this epic slot game is its lucrative Bonus Wheel. The Bonus Wheel appears, in halves, on reels 1 & 2 and 4 & 5. If you match up the two different halves – you’ll be taken to the Bonus Wheel which you’ll need to spin! There are three different types of segments you can land on: a multiplier, a number of free spins or ‘collect’. If you manage to bag a number of free spins, you’ll be back to the reels, except this time, the Wild mage multiplies to give you more wins! After you finish your free spins, you’ll be back for another try with the bonus wheel. If you get a multiplier, your winnings will be multiplied by the specific number you land on, and if the wheel stops on a ‘collect’ segment, you’ll be given your winnings and sent back to the normal game. During the free spins, the music gets even more intense and you’ll be at the edge of your seat the whole time! Aside from our extensive selection of slots and video slots from the very best providers in the business, we also have some fantastic table games which offer high RTP (return to player) percentages and are great for high-rollers. We also host some incredible live dealer games, such as Live Poker and Live Roulette, which are so realistic you won’t believe your eyes! Come and check them out to see for yourself!